Over 4 rounds (ages), players take turns taking actions. At the start of a round, you roll the dice shown on your tiles (players start with basic buildings) and the results display the resources each dice is worth. One action is to buy a tile from the common pool by spending resources (those shown on your dice as well as resource counters already earned). Dice spent this way are ‘used’ so are unavailable until the next round. As you have limited slots, you build tiles over existing tiles and this means giving back any item shown on the tile being covered up but these can come from your used dice or unused dice. For example, you buy a tile giving you 2 yellow dice and place it over a tile that currently gives you 1 yellow dice. Therefore, you return a yellow dice (from your used or unused dice) and then take 2 yellow dice which are immediately rolled and added to your unused dice. The same happens with other items the tiles give you such as re-roll markers – these are returned (from your used/unused markers) when you build over the tiles that give them to you. So, in addition to working what to build in limited spaces with limited resources, there appears to be some interesting extra gameplay in timing the order in which you perform buy actions so you can return your used items rather than those yet to be used. Other actions allow you to use a re-roll marker to re-roll some/all of your unused dice, build a wonder (as this requires extra spending after buying the tile before it is functional), and to pass (when you are out for the remainder of the round). When every player has passed, players spend books from their unused dice/counters to move along the on-going total book track. Players score Victory Points (VPs) for being ahead of other players on the book track (just like in the full Nations game). Then, depending on the round’s event card, Famine is resolved so players can spend food to earn VPs. Next, player order is based on who has the most unused swords (so sometimes you don’t want to spend all your dice). Finally, Warfare is resolved which is like Famine and, depending on the round’s event card, players can spend unused swords to earn VPs. After 4 rounds, players earn VPs from the tiles they have built and the player with the most VPs wins. The game is for 2-4 players. 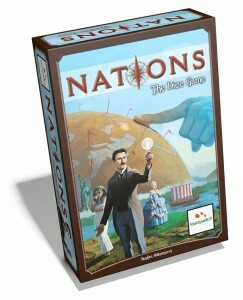 I’m really looking forwards to Nations The Dice Game as it sounds like it packs a great deal of tight gameplay into a small and short game (10-15 minutes per player). Jostling the tiles you have in limited space whilst trying to upgrade sounds like a good challenge just like the full game. Player interaction will be trying to grab the tiles you want (or those others want) first, and I like how using a re-roll marker takes an action so you can re-roll dice but it gives your opponents an opportunity to buy something you want. It reminds me of the brilliantly, gameplay-rich, compact experience of Oddville. Also, it reminds me of how Caylus Magna Carta was a superb, lighter version of Caylus but which still contained all the core gameplay of the full game (and I actually prefer Caylus Magna Carta). I am hoping Nations: Dice Game does the same. 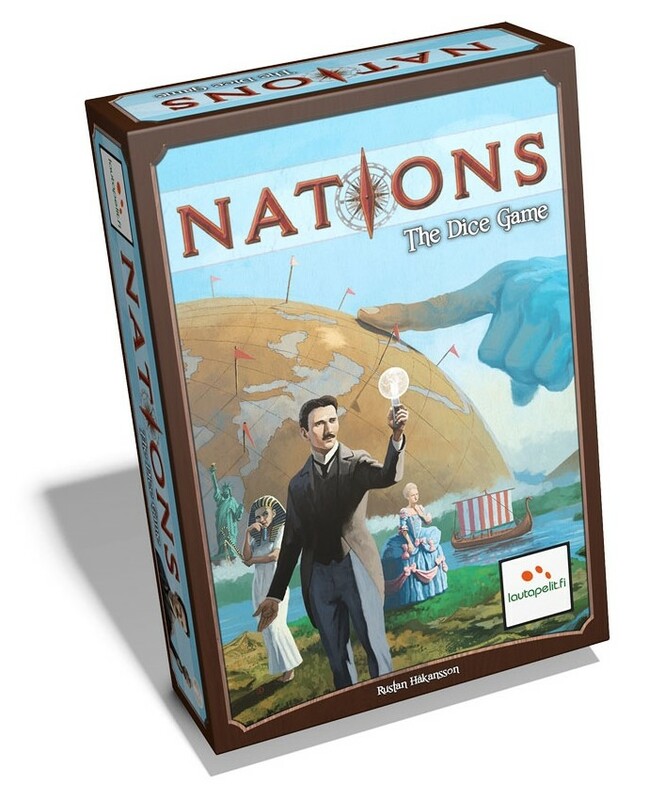 This entry was posted on Saturday, August 2nd, 2014 at 12:50 pm	and is filed under Board Games, Essen Spiel 14, Nations, Nations Dice Game, Preview, Spiel 2014. You can follow any responses to this entry through the RSS 2.0 feed. You can leave a response, or trackback from your own site.